Golf brands change owners with regularity. Golf brands come and go. And it appears that one of the oldest golf brands in the United States - PowerBilt - is, for now anyway, dead and gone from the market. That doesn't mean we'll never hear from PowerBilt again. The "PowerBilt" brand is a licensee of Hillerich & Bradsby, and H&B might want to revive the brand some day. Or sell it to another owner that will. 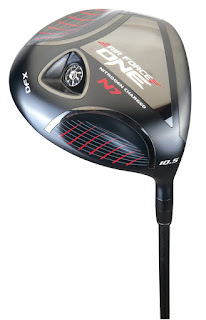 But for now, PowerBilt's most-recent line of golf clubs has been taken out on its own, as a wholly owned entity doing business under the brand name Air Force One. "Air Force One" was the name of a line of golf clubs, drivers in particular, that made up the last few years of product from PowerBilt. The Air Force One driver has a "nitrogen-injected" clubhead. The pressurized gas inside the clubhead stiffens the clubhead walls, removing the need for as much internal bracing. That saves weight, yada yada yada. The new Air Force One, a U.S. company based in Palm Desert, CA, will continue to work with Hillerich & Bradsby entering into a licensee agreement with H&B to distribute nitrogen charged technology golf equipment for international markets. The PowerBilt name will not move forward with the new company in the U.S. "Our goal is to focus on getting the word out and to improve our distribution so we can reach our customers interested in trying our patented technology. We have proven technology that all levels of golfers have shown an interest in and we just need to improve on reaching them," said Air Force One President, Ross Kvinge. ... Air Force One will continue to develop and expand their golf product categories, including drivers, fairway woods and premium irons under the new company. These products will include the re-launch of the DFX MOI and DFX Tour driver. New fairway woods, the AIR FOIL will be introduced along with two new irons - AFX Game Improvement and AFX Pro Series. In addition to the extension in equipment, the company will introduce a deluxe cart and stand bag along with a new soft cabretta leaver glove all under the AIR FORCE ONE brand. What really appears to have happened here is that someone decided, "Hey, why don't we just use 'Air Force One' as the brand name instead of PowerBilt'?" Golfers of a younger age might not realize all the history that PowerBilt name carried. It was one of the oldest golf brands in the United States - clubs bearing the PowerBilt name were first on the market in 1916. Olin Dutra won the 1934 U.S. Open with a PowerBilt driver, and the company's persimmon drivers were considered the standard for many in the 1960s, 1970s and into the 1980s. Fuzzy Zoeller began his career playing PowerBilt, and returned to PowerBilt in 2007 - likely the most-recent tour player to use PowerBilt clubs. But now the PowerBilt brand is gone. And Air Force One is here. "PowerBilt®, one of golf’s oldest and most respected club brands, has named Hireko Golf as its new licensee for the United States. Hireko, based in City of Industry, California is one of the leading component companies in the golf industry. The company looks to leverage its robust and expanding customer base to grow the PowerBilt brand and re-position it for mass appeal."